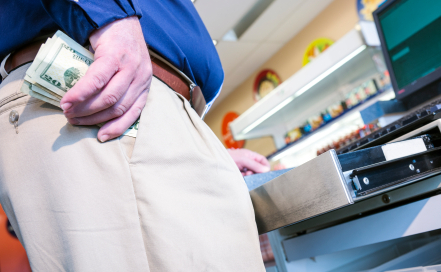 Over the years we have found that some of the most common types of theft cases involve a defendant accused of stealing from his or her employer. There are numerous reasons why employment theft has become such a common type of criminal case. First off, we have seen first hand that employees are often wrongly accused and even arrested for a theft, with which they had zero involvement. This often occurs with employees who have had access or the ability to commit the crime but simply didn’t do it. When things go missing from a workplace, whether it is checks, money, supplies, or other materials, employees are often the first people blamed. The managers or owners are always upset and wish to resolve the incident in the quickest possible manner, and sometimes, innocent employees end up taking the blame. Our advice if you or a loved one has been accused of stealing is never to talk to law enforcement, but rather contact an attorney first. Police tend to twist the words of those who decide to speak, and even if a person played a minor role in a theft he or she could end up taking the brunt of the blame. There are also many cases where there is sufficient evidence pointing to a certain employee, and in these cases it is essential to retain an experienced and aggressive criminal lawyer. Just because you or a loved one has been caught with what seems to be an insurmountable amount of evidence does not mean a lawyer cant help. In fact just the opposite is true. We have fought for numerous employees that have been charged with theft from their workplaces throughout Maryland, including bookkeepers, cashiers, secretaries or assistants, stockers, and accountants. We never assume that our clients will plead guilty regardless of the evidence, as there is always the possibility of working toward a dismissal. In cases where a dismissal or trial is not likely, we will still fight to work out the best possible resolution. In all theft cases, regardless of the amount or whether it is a felony or misdemeanor our two main goals are to keep our clients out of jail and to keep a conviction off their record. We simply are not satisfied until we can achieve both. Benjamin Herbst has represented employees in theft cases ranging from simple misdemeanors under $100 all the way up to felony theft over $10,000. He has also successfully represented clients in theft scheme cases and fraud cases involving employers, such as fraudulent use of a credit card. Many of his clients have little or no criminal record, and maintaining that record is of the utmost importance. But if you or a loved one has a long criminal history Benjamin will not treat you like a criminal and will make sure the system doesn’t either. Each person is innocent until proven guilty, and sometimes the judicial system tries to forget this. State attorneys and judges can try to convict before any evidence is heard, but Benjamin does not let this happen to his clients under any circumstances. Contact The Herbst Firm today at 410-207-2598 for a free consultation about your case.